Over 200 asbestos victims, lawmakers, trade unionists, and lawyers gathered in Brazil. After three days of seminar programming in Brazil, I am leaving filled with so much inspiration and admiration. It was an honor to join such passionate and knowledgeable advocates discussing how the global anti-asbestos community can partner for prevention. The first two days of Brazil’s International Seminar on Asbestos: A Socio-Legal Approach kept an academic focus, with doctors, engineers, and activists discussing various aspects of the fight to end the asbestos disaster globally and specifically in Brazil. The final day of conference programming gave the spotlight to victims and their advocacy efforts. The National Gathering of Relatives and Victims of Asbestos was equally powerful in a different way. Having the opportunity to connect with workers exposed in the Brazilian mines, where almost all of the asbestos used in the U.S. originates, was a strong reminder of why ADAO fights to end asbestos use globally. Brazil remains one of the world’s major producers of asbestos, and U.S. corporations continue to purchase Brazilian asbestos despite knowing what a perilous trade they are supporting. I presented in the third panel, “Representatives of international delegations – the anti-asbestos fight in other countries,” alongside my esteemed colleagues Assunta Prato and Agata Mazzeo of Italy, Carmen Lima of Portugal, Dr. Barry Castleman from the USA, and Laurie Kazan-Allen from the UK. Fernanda asked me to focus on social media advocacy and share how ADAO uses our strategic communications, graphics, and personal stories to make change happen. Check out the incredible program of panels and list of speakers on the conference website. Brazilian ex-Senator and newly elected councilman, Eduardo Suplicy. During the victims’ gathering, the ADAO team launched a photo campaign to show the faces of the Brazilian miners who are needlessly exposed to deadly asbestos, in part due to the greed of American corporations maintaining demand on this toxic mineral. More than 200 asbestos victims, trade unionists, lawmakers, and lawyers posed for photos holding a sign calling for “Brasil Sem Amianto,” which translates to “Brazil Without Asbestos.” Stay tuned, we are creating a photo collage that will put faces to the human rights atrocity occurring in Brazil. One of the most powerful photos came from popular Brazilian ex-Senator and newly elected councilman, Eduardo Suplicy, who took an incredibly strong position in support of eradicating asbestos in Brazil and worldwide. Between giving two presentations, connecting with allies, and launching our Brazilian Raise Your Voice Photo campaign, there is no way I could have done this alone. Thankfully, ADAO’s newest board member, Ellen Costa, was by my side making sure Team ADAO didn’t miss a beat. It was encouraging to see this passion and drive in a country that remains one of the biggest producers of asbestos. 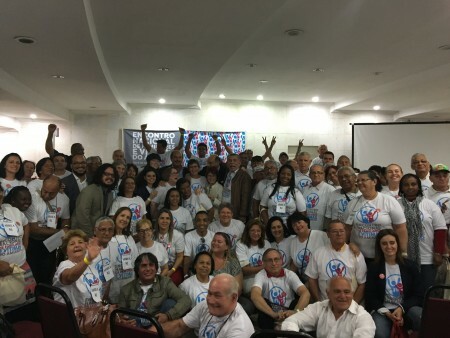 As we in ADAO know, a small group of dedicated citizens can make a big difference, and I am so excited to see what is in store for anti-asbestos activism in Brazil. I’m very grateful to the Brazilian government for inviting me to be a part of this phenomenal seminar and giving me the opportunity to connect with victims and experts alike in a country that is very significant to the global anti-asbestos movement. The sense of solidarity between international victims, experts, and advocates was incredibly powerful. When we partner for prevention, we make change happen! This entry was posted in Blog and tagged ABREA, ADAO, AFEVA, Agata Mazzeo, Arthur Frank, asbestos, Asbestos Disease Awareness Organization, Asunta Prato, BArry Castleman, Brasil Sem Amianto, Brazil, Eduardo Suplicy, Ellen Costa, Fernanda Gianassi, GBAN, Linda Reinstein, mesothelioma, National Gathering of Victims and Relatives of Asbestos. Bookmark the permalink.